Ruby is one of the most beginner-friendly and flexible languages on the web. It’s more popular than you can imagine. Really! GitHub. 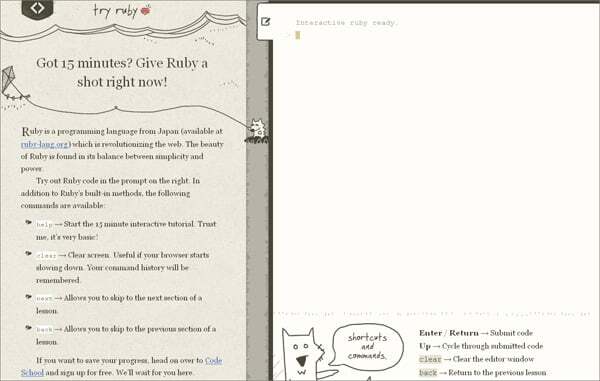 Fiverr, CrazyEgg, Hulu, Imgur and other popular websites are developed with Ruby. 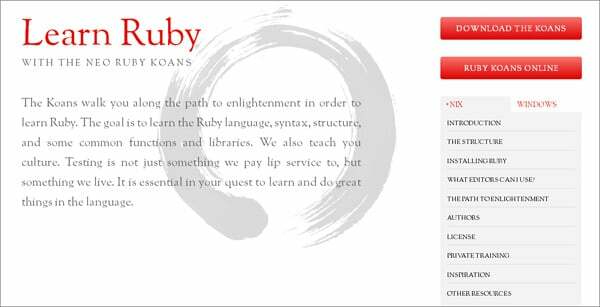 Today we’d like to introduce Ruby to you as it is a really great language. 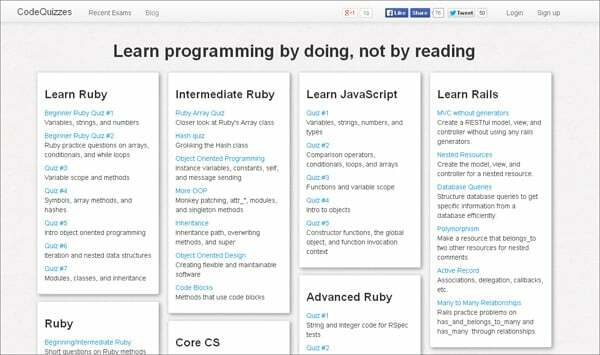 So look at the online Ruby courses below and complete them one by one. Here you can learn Ruby from scratch. Each lesson includes instructions, hints (if needed) and practical tasks. Here is also a Ruby glossary for beginners. The course is created by Mike and Nicole Clark, experienced development trainers. For $179 per student ($135 for alumni) you’ll get 25 videos, 21 exercises, cheat sheets and proof of completion. It takes a very practical approach, teaching you how to write a complete Ruby program from scratch. Here is a very basic course for Ruby and Rails developers. The course is not free, however the price is quite low: $25 basic account (1000+ videos, Code Challenge Engine for live practices, access to members-only forum) and $49 pro account (full-library access, talks from industry professionals, exclusive workshops and interviews). This tutorial will fit developers who like to read a lot. It includes a lot of theory and examples of code. Students can always back to previous lessons and revise the materials. If you need some written notes for Ruby development this course is ideal for that. This is probably the most beginner-friendly course because it needs no prerequisites. So if you want to get a great Ruby introduction you should take this course. To become a student you just need to pay $29 per month. The good news is that for the money you get a full access to all courses. This Ruby Bits targets Ruby 1.9.x. To learn the course successfully you need basic programming and basic Ruby knowledge and skills. The gamified framework of the lessons will help you complete them with ease. Lectures and challenges are free. This advanced Ruby Bits course requires you to know Ruby Bits Par1 (look ahead). The course has 6 levels with 6-8 challenges included. It’s a funny way to learn Ruby for you and your team. It is an online Ruby course with interactive Ruby console where you can type code, submit it and see the results immediately. It will teach you fundamental programming concepts and how to use them right. It is a very basic interactive tutorial to practice Ruby by following prompts of the program. A hand-drawn game-like interface will help you feel comfortable and enjoy the process. Here you’ll find several courses and quizzes to learn Ruby, Rails and other programming and coding skills. It is absolutely free. Here is a written practical guide for developers who code with Ruby. By now you can read some articles that were publicly published earlier. If they are good enough you can subscribe for Practicing Ruby for $8 per month. This online multi-media course includes 16 HD videos, 34 exercises in workbook, 2 app examples, email support, etc. All you need to have is a computer with Internet connection and that’s all. The course costs $179 per student and $135 for alumni. This course is aimed at helping you to learn Ruby on Rails in your browser. Here you’ll get 5 videos with exercises. If you’ve never learned Ruby this game won’t please you, so choose more basic course. If you’re a profy Rails developer it is not for you too. But if you want to learn the basics of web application development with Ruby on Rails then welcome on board! It is not exactly an online course, but a well-done fundamental guide for getting up and running Ruby on Rails. A lot of links to supplementary resources will help you get better understanding of the programming. This is a convenient way to learn Ruby programming online or by downloading lectures. You’ll find out more about Ruby, syntax, structure, common functions and libraries. Here is a set of free Ruby courses for beginners and advanced programmers. There is a free Ruby library with nice hand-drawn illustrations. The course requires an intermediate ruby knowledge and understanding of Rails testing for Zombies. Both teachers, Greg Pollack and Olivier Lacan, are experienced developers. The course features RSpec 2.10.x, with most concepts working in any 2.x version of RSpec. This training is needed if you want to cope with RSPEC testing. Before starting refresh your Ruby and programming knowledge (intermediate level is needed). The course is gamified, so you’ll get badges for completing levels. The curriculum is aimed at developers who are new to Ruby programming language and objective oriented programming. It includes 3 professional courses: Introduction to Ruby and web development, Rapid prototyping with Ruby on Rails and Build robust and production quality applications.